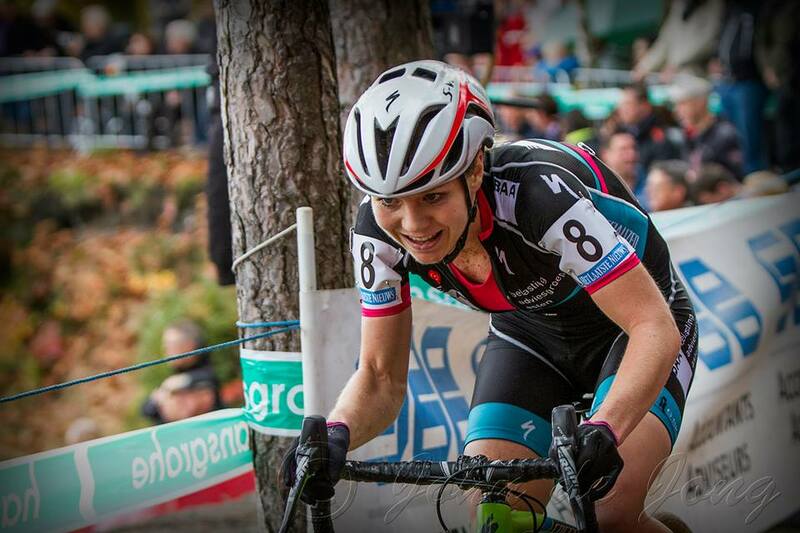 In the lead up to the MTB Marathon World Championships I got in touch with speedy fellow Dutchy Sanne Van Paassen. Sanne was an absolute champion in the world of cylco-cross, making her way back to the top after 2 years of being injured. 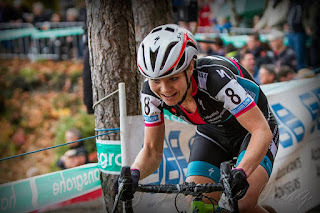 I started reading her blog, got intrigued by her passion for the sport and before I knew it I found myself watching the first Cyclo Cross World Cup of the season in Las Vegas on live streaming. “I have bought a cyclo cross bike on ebay” I heard myself say to Michael who looked at me with a surprised expression on his face “I thought you meant to be resting this winter” he replied. “yeah, but this way I won’t ruin my MTB in the mud and snow on winter rides” I defended myself. I was back to owning 4 bikes. 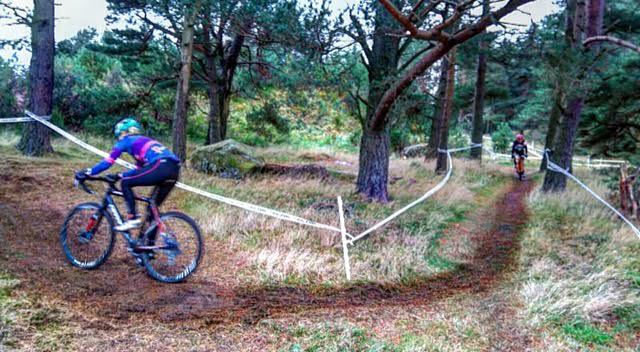 Two weeks later I found myself entering the second round of the Scottish National Cyclo Cross Series. When I told Michael, my excuse was that the race was only an hour away from home. “I won’t be training for it” I reassured him. 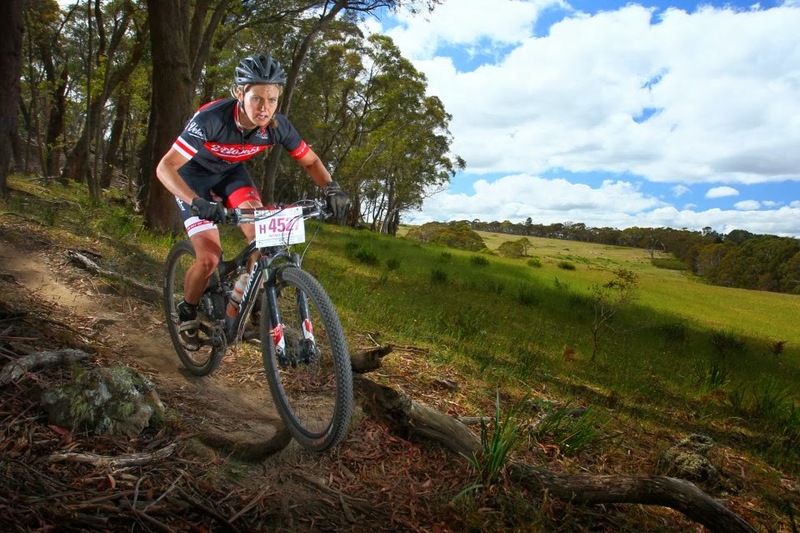 I had managed 3 rides to get used to my Canondale CAADX bike before the race and I was hooked. 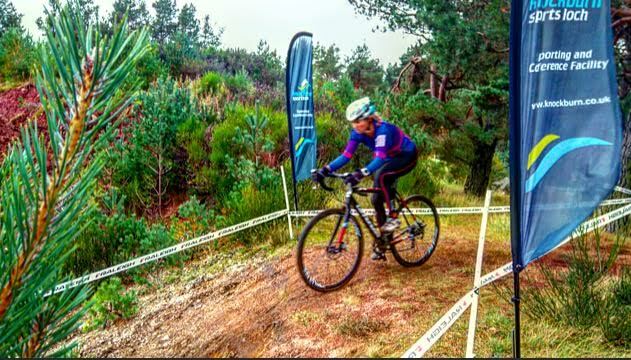 Although I had been sitting on the fence for a long time in relation to cyclo cross finding it a bit of a strange sport, being a mix between mountain biking and road cycling. I never understood what people liked about it. And then I rode my cx bike for the first time. I absolutely loved it. I had bought an introductory bike which I am sure felt a lot heavier than my MTB but it rode like a treat and I was very excited about finding my way into a new sport. Race day arrived and I was nervous for the unknown but very relaxed in every other way. I was not a sprinter by any means and the 45 minutes of racing was going to be about 4hrs to short for me. 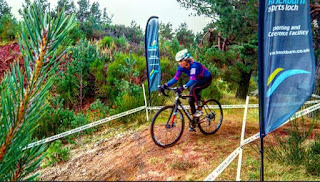 I felt, for me, very unfit and knew I was racing girls from a descent level coming from top road backgrounds (including Common Wealth Games cyclists) and MTB back grounds. Some of the girls were very experienced in this discipline. Finishing last was very possible and I was ok with that. 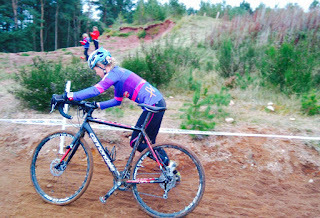 I met Lizzy Adams before the race who so kindly brought a spare tube for me after I discovered the night before I had a flat and no spares to replace it with! Through her I got introduced to the lovely Cathy Wyse another machine on the bike and not much later we run into the bubbly Marie Meldrum. I got given pointers and advise in the warm up of which I was very appreciative and the girls explained the format of racing to me. I felt ready for the start!! Whilst riding the course I discovered that my nearly slick tires which came with the bike were less than ideal but it made me giggle slipping through corners and having absolutely no control in the mud! At one point in the race I was going full bore on a flat wet and muddy bit of grass and my bike was actually not moving forward!! New tires have been ordered. Getting off and on the bike fast is a challenge!! I can’t remember the last time I had so much fun racing!! 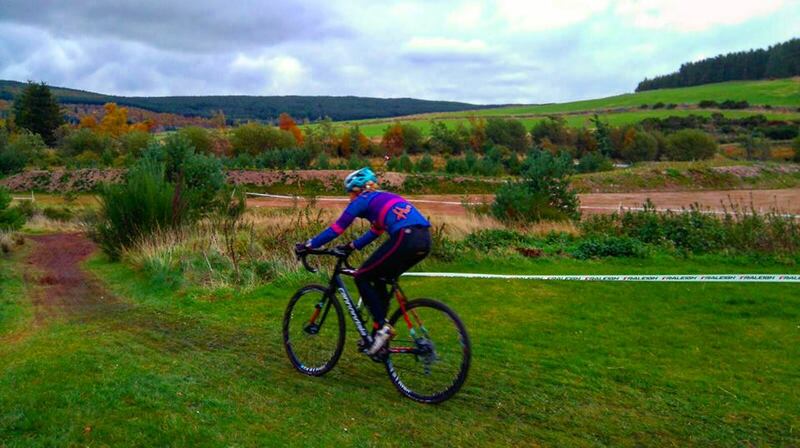 I loved every minute of my first cyclo cross experience and almost felt disappointed when the race was over. I felt like a kid again!! 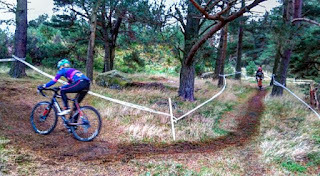 It was twisty and fast, up and down, tree roots, little drop off, hurdles, off camper mud, mud and more mud! I gained a bit more confidence every lap, cornering a little tighter, getting off and on the bike clearing the hurdles a little faster. I learned so much in 45 minutes of racing!! And very excitingly I did not finish last!! Marie and I went for an easy 20 minute run post race which felt so refreshing. Like always it was lovely to catch up with Marie, comparing our experiences of the 2015 season with our highs and lows and making new plan’s for 2016. It would have been so easy to fall back into the trap of training hard because this race definitely stoked up my fire again to become fitter and faster. But I am fully aware that that was not part of the plan, and it would not do me any good looking ahead. Instead of clocking up serious amount of hours on the bike, I will be sticking to my plan of staying mostly on the couch this winter. And instead of getting faster by fitness, I will try and improve by working on my skill’s, racing that little more efficient, that little (or a lot) smoother and going that little faster. The nicest thing about it all is that it will be completely without pressure or expectation's I put on myself. “Will you come to the next round” asked Lizzy after the race “Hell yes, I had so much fun! !” I answered with probably the biggest smile on my face post race I have had in a long long time. At the end of the day, I am a racer, I love it, it is in my blood. Fit, unfit, fast, slow, good or bad, there is nothing better than the feeling of improvement within a race at whatever level.